One month prior to snapping this picture, our customer discovered her dishwasher had been leaking… for some time. 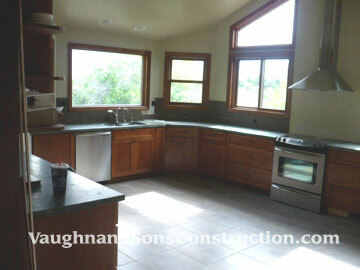 Because the damage was extensive, Vaughn & Sons removed the cabinets and flooring to rebuild the kitchen. We worked with the homeowner and insurance company to install a beautiful new kitchen. Our customer was delighted with the results! When you are ready, give Vaughn & Sons a call for a free estimate for your water damage project! (775) 324-1935. Vaughn & Sons Construction, Inc. has been a BBB Accredited Business since 4/12/2006. We are licensed and fully insured in both Nevada (#62106) and California (#967311). 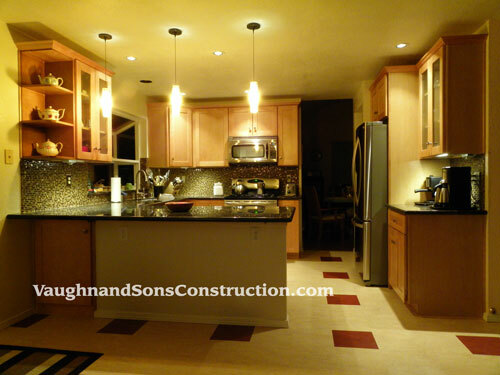 Call us for a free consultation on your home remodeling project: (775) 324-1935.